There are good reasons why Andalucia, Extremadura or the Pyrenees are often the first places in mainland Spain visited by wildlife enthusiasts. However two Honeyguide holidays in Valencia have shown that this region also has much to offer, with the right local knowledge. Pau Lucio provides that local know-how as well as plenty of experience of the Honeyguide style. Pau is a member of local ringing group Pit-roig (Valencian for the robin), supported by this holiday’s conservation donations. One of the group’s regular working areas is Pego Marshes, not far from our hotel tucked away in an orange grove outside the town of Oliva. 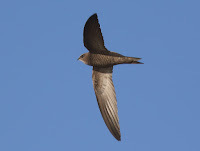 On our first visit to Pego Marshes in 2018 the late afternoon sunshine provided perfect conditions to see low-flying pallid swifts, often a tricky bird to see well.